ELKO — Mike Armstrong sat on the edge of his bed in the Red Lion Hotel and felt for his iPhone. He thumbed through the phone’s assorted menus with the aid of a VoiceOver application, which directs the user by way of an automated voice. 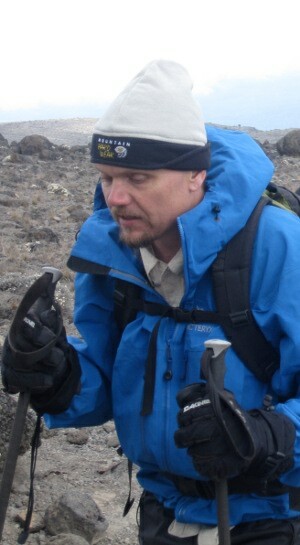 After a few moments of exploring, Armstrong finally found the song he wanted to play in his iTunes. The music began and Armstrong closed his prosthetic eyes, while his feet tapped in rhythm on the carpeted floor. The song was a single performed by Armstrong’s musical group, the Michael Paul Band. Two of the band members are blind. Armstrong is one of them. He was visiting Elko to present a few workshops and a motivational speech at the Adobe Middle School on Aug. 25. Armstrong was diagnosed with non-diabetic retinopathy after an injury as teenager affected his right retina. Doctors warned him that too much physical activity could be devastating to his eyesight, but Armstrong was already a second degree black belt in the martial arts. I am embarking on a new goal (2012 Paralympic Judo Team). As a Martial Artist/Sensei I have felt a strong desire to compete. I have participated in tournaments in the forms/Kata division, but that is non-combative. Standard sparring (Kumite) is rarely open to a blind competitor due to the possibility of injury. After investigating the options in Martial Arts based sports for the blind, I have found there is a Blind Judo division on an international scale. With my experience in Jujitsu I feel that this might be something I can participate in. Although Jujitsu has many of the throws used in Judo, I knew that if I wanted to compete I would have to find a Judoka coach. Ben Cane (one of my students) was the first person to talk to me about competing in Judo. Ben has had an interest inJudo for several years himself, so I asked him to help me search for a Judo instructor. This eventually led me to Sensei Phil Brier. 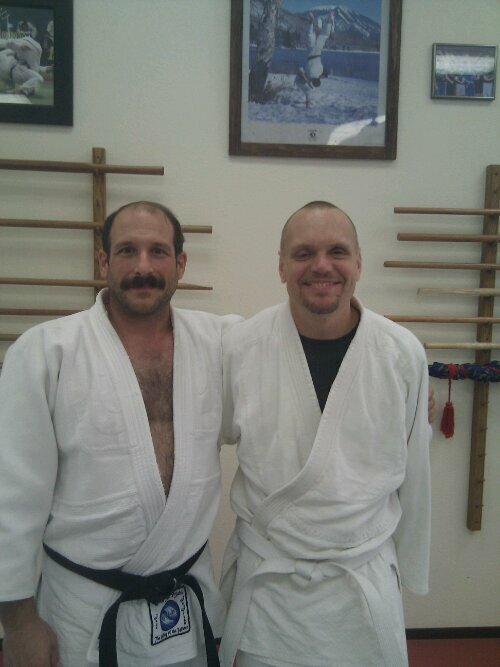 Upon speaking to Sensei Phil I immediately knew that I had found a truly passionate Judoka. Our forty minute phone conversation ended up leading to a two hour meeting later that same night at my dojo. Our mutual love of martial arts made us immediate friends. I was impressed with his knowledge and experience in competition Judo. I am excited to say that I have found my new Sensei/coach. My first night in Sensei Phil’s class was incredible. His dojo (the Mizu No Michi club) is about fifteen minutes from my house. Unfortunately my last class ended at 6:15 and Judo class starts at 6:30. After finishing teaching my Karate classes I hurried to get ready for Judo. Ben was waiting for me as I ran out of the house. The second I closed the truck door Ben was off. I had informed Sensei Phil at our meeting that I would be a bit late, but we would get there as soon as possible. As Ben and I entered the dojo, I put on my fresh new white belt. The last time I wore a white belt was twenty five years ago. I must say it felt kind of good to start a new. Over the next two hours we covered the fundamentals of Judo. The differences are fascinating. I have a second degree black belt in Aiki Jujitsu, but Judos method is quite different. I was partnered up with a green belt named Dave. We started with some ground fighting from a back to back position. Dave also trains in Brazilian Jiu Jitsu, so we had a blast. This is when I learned that we are not aloud to use leg locks. Oops. As Dave and I were rolling around, Dave went onto his back and put his legs up to put me in the guard. This position is where a student wraps their legs around their opponent from the bottom. This can shut down many attacks from the person on top. As Dave lifted up his legs to trap me, I grabbed his right leg and proceeded to put him in a leg lock. After a short struggle, he tapped out and said nice leg lock. This is when Sensei Phil informed me that it was an illegal move in Judo. With an embarrassed smile, I apologized. The remainder of the class was dedicated to some ground techniques and hip throws (ogoshi). I have now been to three classes and I believe that it has not only helped me in Judo, but also given me a better understanding of my Jujitsu. Only time will tell how I will progress in this sport. I have a lot of ground to make up if I am going to make next years Paralympic team, but Sensei Phil believes that it is possible. I am not afraid of hard work. My plan is to train hard, listen to my teacher and Practice-Practice-Practice! Sensei Mike was recently interviewed by Channel 12 news. You can watch the video below.